The Putnam County Middle School gymnasium (You know, the one with the proscenium arch?) is no more. The bleachers can no longer spin around because they no longer exist. The Pet Rocks have made way for the southern belles of Steel Magnolias. 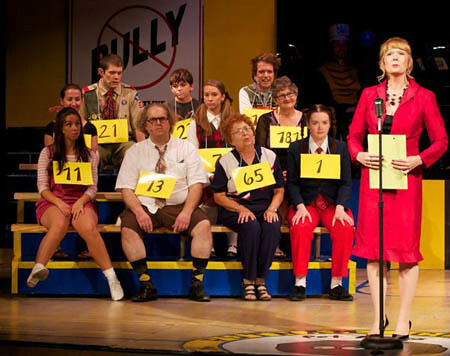 The 25th Annual Putnam County Spelling Bee is now part of Muncie Civic Theatre history. All good things must come to an end. Damn it. However, it was one hell of a ride! Thank you to Craig, Phoebe, Michael, Laura, Scott, Jabrael, Chris, Lisa, Cody, Hannah, Cailtin, Hyunyoung, Jason, Jennifer, Ian, Nathan, Jacob, Todd, The Mighty Joe Skeen, Bob, Jorge, Dave, Mr. Todd Sandman, Annie, Pip, all of our wonderful guest spellers, and our small, but oh so mighty, mighty audience for being part of this grand adventure! I'm humbled and honored to have been amongst so many talented and wonderful people. Thank you all! The Putnam County class of 2011 will forever rock!